I have a problem and the explanation might be lengthy so please bear with me. I have a Warwick Streamer Stage 2 which I bought second hand few years back and it had upgraded Bartolini pickups and preamp. When I first got it, it behaved strangely when using the bass control. It sometimes dropped out and when maxed it made a clicking sound. I took it to a tech and I dont think he looked at it thoroughly. He just said that the pot was not grounded. I gigged it two weeks ago and it was fine. I went to a band practice last weekend and then it had stopped working. I managed to play it in passive mode and I was looking at it when I came home. The strange loud click is back when I turn the bass control. I was looking at it this morning. 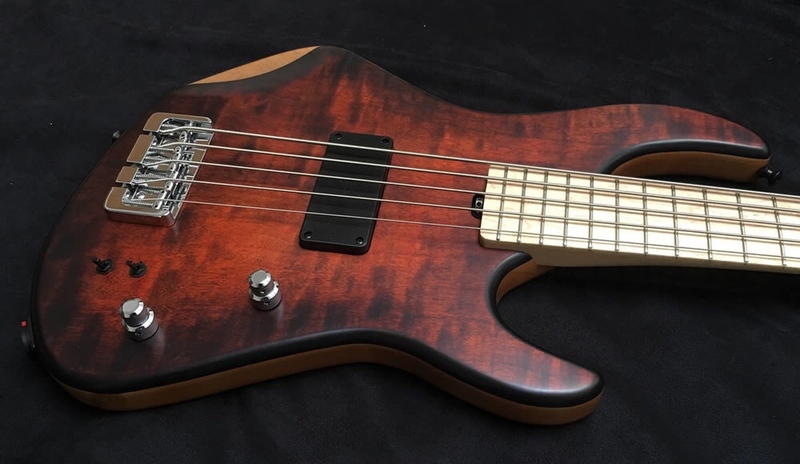 Its the old Bartolini NTMB-918FL which has two parts. The old MEC preamp came with the bass and I am assuming that all pots and controls came stock with the bass. After looking at the diagram and looking at the wires (and its a lot) I am not sure if it has been done correctly originally. I always assumed that the stacked controls were mid and treble and bass was separate but by that diagram I am wrong. Very embarrassing to say that after playing bass for almost 30 years and most of that time with active electronics but not being able to tell the difference between mid and bass lol. Does this sound like something someone has come across (fault pot maybe) or is this something more complicated? I have changed pickups number of times in guitars but I have never done anything to my basses because of the pre-amps. I noticed in one thread that @ICBM said he deals often with active electronics. Is this something you might have an idea what might be causing it? Sorry. Definitely going to require photographs of the actual electronics in your instrument. I have found Bartolini wiring to be surprisingly flimsy for the price. Corrosion can strike almost anywhere. The soldering terminal tabs are a favourite spot. If the pre-amp modules are sealed in resin, anything faulty beneath the resin is going to have to stay that way. tech ... said that the pot was not grounded. The pot is certainly not grounded to its own chassis in the conventional manner. It is not meant to be. The grounding happens at the pre-amp module. Pics added. Thanks for the reply but I was just regurgitating what the guy said. I thought at the time he did not seem to have a clue and was just saying some random stuff to keep me happy. He set the bass up really well and the problem went away but I never thought it had been fixed properly. I noticed in one thread that @ICBM said he deals often with active electronics. I do... but I didn't say I liked working on them. They are mostly the work of Satan. I actually regard most of them as poorly-designed and unnecessary, and troubleshooting is very often a massive pain in the backside. I would replace that pot first as the most likely cause of the problem. If it was me I would actually dismantle it carefully and see if I could see any reason it could be faulty - eg a crack in the trackboard, although they can be difficult to see - I like to be sure I've found the reason for a fault if I can, it makes it more likely that it's fixed. As Funkfingers said, if the problem is in one of the resin-potted boxes you're stuffed. After looking at the diagram and looking at the wires (and its a lot) I am not sure if it has been done correctly originally. Insomuchas all three EQ pots are of equal value, it is possible to connect them to the electronic modules in any order you like. The old MEC preamp came with the bass and I am assuming that all pots and controls came stock with the bass. The pots in your photographs look like the disappointing Bartolini items. The stacked EQ pot looks better than anything that Bartolini supplies. MEC pots have unusual, square baseplates and terminals. The legend MEC and the part number is stamped into the pot. I always assumed that the stacked controls were mid and treble and bass was separate but by that diagram I am wrong. The convention on most instruments - including Warwick themselves - is that the upper half of a stacked pot is treble (top, get it? ), the lower half is bass (bottom), leaving a third pot for midrange duties. Sometimes, the midrange control can have two elements. The upper half of a stacked pot will be cut/boost. The lower half of the stacked pot dials in the centre frequency at which that cut or boost is applied. So sounds my options are limited. I am not sure if my skill set is up to the task of diagnosing the problem and fixing it. I can live with it but I this will need to be fixed at some point. This is my main bass and I gig it few times a month. I do have two other backups so thats not a problem if it is out of action for a bit. I am based north of Perth so a trip to Glasgow is not out of the question to take it to ER (@ICBM if he does not mind having a look since this is not your favorite thing I would not subject you to this if you were against it). I do realise that there might be some cost and nothing might come out of it. Should I first try and change that pop and if so which one should I get instead? Should I just bite the bullet and get a new preamp instead? I have thought about it and I guess the usual suspect would be an option. Another Bartolini, Aguilar, Glockenklang, John East or Sadowsky. I have two other Warwicks with Bartolinis and I quite like that sound. I also have another with EMG which is fine but I dont think I would want to go down that road with this one. I am based north of Perth so a trip to Glasgow is not out of the question to take it to ER (@ICBM if he does not mind having a look since this is not your favorite thing I would not subject you to this if you were against it). I'd be happy to look at it, despite what I said above . At least it's not an electro-acoustic with multiple pickup sources... those truly are a nightmare to work on. If anyone else has any suggestions I am willing to listen. I haven’t tried one personally, but seeing the pics you posted I would say it looks like a very well-designed system and much easier to troubleshoot in the (hopefully unlikely) event of a problem. They are incredibly well regarded for just that reason - modular, so you can replace individual components - and solderless pickup connectors do less faffing and chance of damaging it on install. I’d say looking at the boards on each component they would be a relatively easy fix if ever required as well. Oh, and they sound really rather good as well, which is a bonus! What happened to the real @Bridgehouse? ... the one who kept telling us that all we need is a P bass. I’ve just bought a 5 string with active electronics. Pics or it hasn't happened. I’d be tempted to rip out the preamp and not replace it. A few years ago the preamp in my Warwick thumb started playing up, and I decided that since I had eq controls on the amp I could go without them on the bass. So I wired both pickups together directly to a volume and out to the amp. A less drastic approach would be to leave a blend control in, or separate volume pots per pickup. Depends how much of the preamp functionality you regularly use. Having used a *good* active system live I really do prefer it - but it has to be a good one. Even a lot of high end basses use some dross that just doesn’t do the job and is unreliable. The John East stuff is, however, spot on. A *good* active EQ system enhances the instrument on which it is installed. If the frequencies at which the EQ bands act are badly chosen, the system might as well not be there. For this reason, I prefer onboard EQ that makes it possible to adjust the centre frequencies. I am not sure if it has been done correctly originally. I always assumed that the stacked controls were mid and treble and bass was separate but by that diagram I am wrong. Looking at your first photograph again, it is possible to trace the purple wire from the single EQ pot to the shorter Bartolini module. This confirms that the offending pot is the Mid control. The wiring in your instrument conforms to the schematic - except for the DP3T frequency switch. You should have a look at how the P-retro works.. Probably more helpful to have a listen to how it works. Thanks, yes I did spot that having the schematic to look over what was what. The bass is currently being looked at by ICBM and we shall see if this can be fixed. I could not agree more. All basses I have had over the last 25 years have had active electronics. This is all though personal preference and I guess we all have different ideas how our gear should be and sound. But I happen to like active electronics and Warwicks. Not everyone’s cup of tea I know but for me it always sounds fantastic.